This bread is made using the Easy Bread method of kneading. It has the a great flavour, perhaps because it is allowed to rise slowly, over a long, 10-12 hour period. 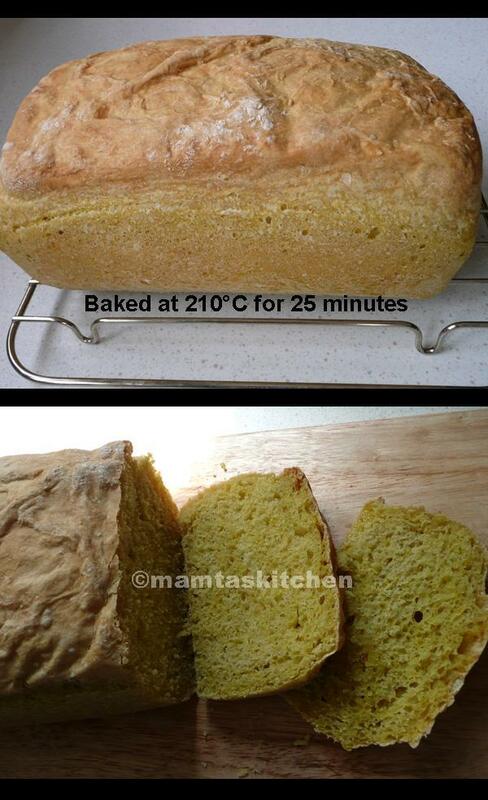 Adding turmeric to the dough is not only healthy, it makes the bread look nice too and gives it a subtle flavour. See other variations below. 1/2 tsp. quick yeast, dissolved in warm water for 15 minutes. You do not need to do this if using instant yeast. Variations: Add any one of the following. Remember to adjust the water accordingly. The dough should be soft, but manageable. Add 1/2 to 1 tsp. chilli flakes. These can be added to onion, cheese or other breads too. Experiment with other additions/combinations and send me your pictures! Measure water in a jug and stir in yeast, until it is dissolved. Keep aside for 15 minutes, until it begins to froth. Meanwhile, measure all other ingredients. Add and stir in turmeric and oil into the yeast water. Place flour and salt in a bowl and make a soft dough, using as much water/oil mix as needed from your jug. The dough needs to be really soft, almost sloppy. Cover and leave in the kitchen overnight or for 8-10 hours. It should be well risen, bubbly. Flour your worktop and hands liberally. Turn the dough out using a spatula or your fingers. Flatten it with palms, stretching it out. Now fold in from both sides to the centre, overlapping one end over the other. Turn the whole thing over, rotating it a right angle, so the seam is now horizontal. Flatten it out again and fold again from both sides, overlapping in the middle. Lift it out and place seam side down into a bread tin or for a free-form bread, onto a baking tray. Let it rise until it gets double in size and feels springy to gentle touch. Turn the oven on to 210C or 420F. Bake in the centre of the oven for 20 minutes. Check by tapping on it (hollow), colour is brown all over. If necessary, bake it for another 5-10 minutes. I find that in fan oven, 22 minutes is usually adequate. Some Indian 'combination' ovens heat only up to 180C. Bread takes about 45-50 minutes to bake in these ovens.